Advanced subwoofer design in a specially engineered enclosure to bring out the best in your music. 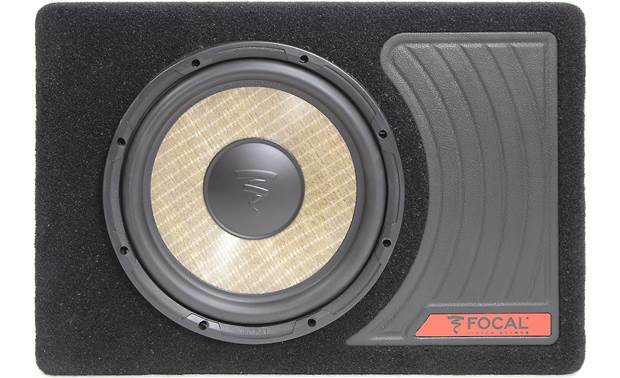 Focal's gained a worldwide reputation for innovative speaker design and state-of-the-art materials, and now they've brought their expertise to ready-to-install subwoofer enclosures made to bring the best out of their subs, and out of your music. Their FLAX Universal 10 sub enclosure gives you a high-performance 10" sub in a 5"-deep truck-style enclosure designed to put big bass into today's smaller cars. 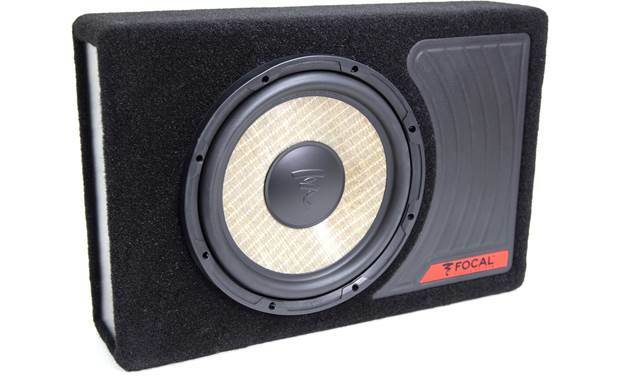 The package features Focal's Performance Sub P 25FS 10" shallow-mount subwoofer. Its advanced design includes a flax fiber/glass fiber laminate cone that gives you the warmth of natural fiber and the superior accuracy of glass — you'll get solid bass with minimal distortion. Handling up to 280 watts RMS, the P 25F is a perfect choice for bigger bass in smaller spaces. The speaker's 4-ohm impedance works with most amplifiers, and its post-style wiring connectors make wiring simple. The FLAX Universal 10's enclosure is custom-made to bring out the best in the sub. Its sealed design keeps your bass tight and punchy, and its shallow depth lets it fit into smaller spaces. The box is solidly built of industry-standard MDF with black carpet covering for protection — a leatherette insert with the Focal logo adds extra style points. The enclosure is filled with Blackhole's Stuff, a 100% cotton sound-deadening material that reduces unwanted resonance to keep your low end clean. You can listen to music through any speakers, but why not use great ones? Your space is ready for big-time bass, and the FLAX Universal 10 delivers. 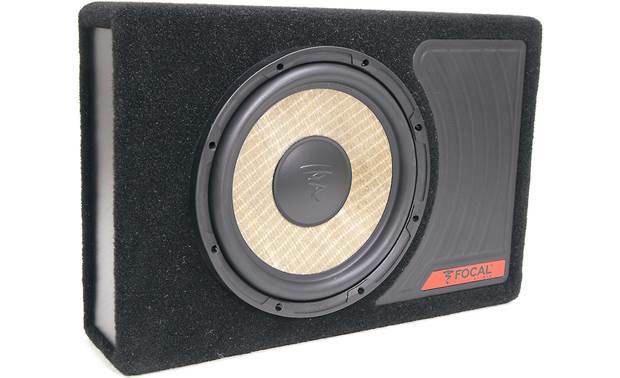 Overview: The Focal Universal 10 features a 10" P25FS subwoofer mounted in a compact sealed enclosure designed to take up minimal vehicle space. 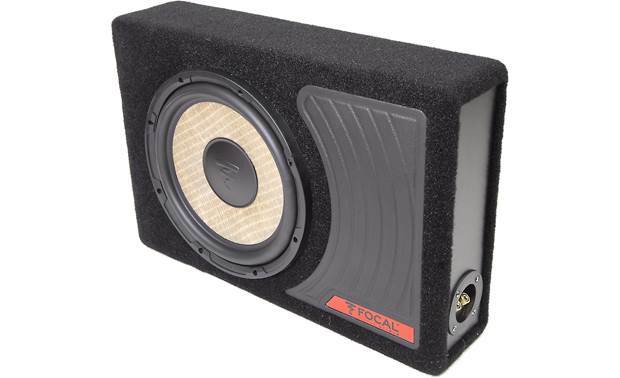 The single 4 ohm subwoofer can handle up to 280 watts RMS (560W peak), providing deep clean bass for any size vehicle. Driver: The included P25FS 10" driver features Focal's patented Flax technology incorporated into the cone design. With a hollow fiber structure, flax is twice as light as fiberglass while providing low elasticity and high rigidity. A "dual-magnet" design and fiberglass voice-coil material help reduce overheating while providing high excursion, resulting in deep controlled bass. 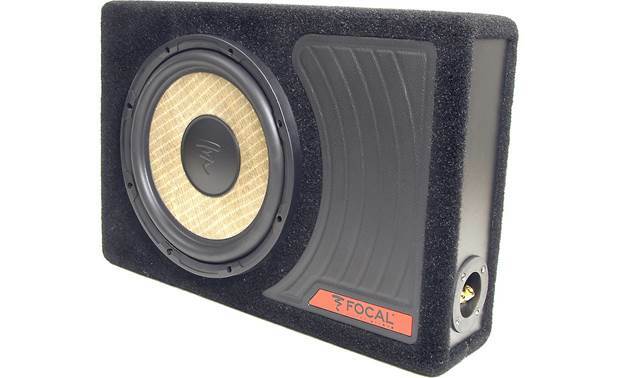 Enclosure: The Focal Universal 10 subwoofer's sealed enclosure is constructed of rigid MDF (Medium Density Fiberboard) for low resonance, and is lined with Blackhole Stuff damping material. This 100% cotton material provides superior damping over conventional enclosure materials such as polyester or fiberglass. 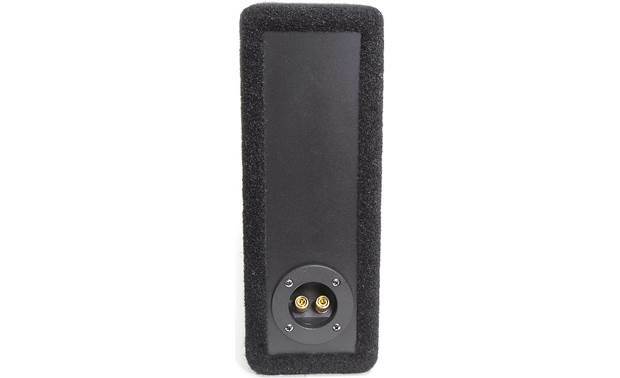 The enclosure and sub together provide a frequency response of 44Hz - 500Hz. The enclosure is protected from dings and scratches with an attractive black carpet covering and includes a black leatherette insert with the Focal logo in red. Terminals: A terminal-cup on the side of the enclosure houses two threaded binding-posts with knurled tensioning-nuts. Each terminal-post can accommodate bare speaker wire up to 12 AWG or banana-connectors. 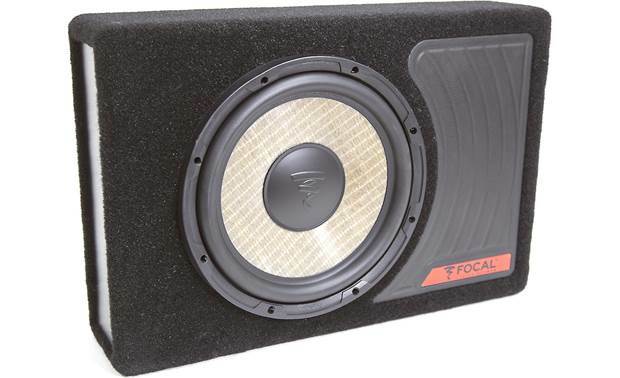 Dimensions: Width - 19.188", Height - 13.0", Depth - 5.188"
Searches related to the Focal FLAX Universal 10 Sealed enclosure with 10" shallow-mount subwoofer.